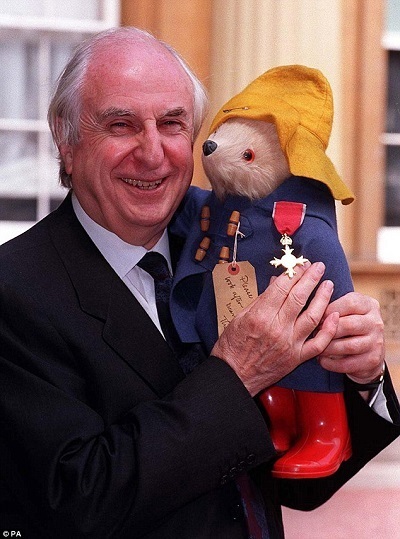 Michael Bond, the English author of the popular Paddington Bear children’s books, died recently at age 91. While best known for the Paddington Bear books, he also wrote four books about Thursday, a mouse; the Olga da Polga series of seven books about a guinea pig; seven books about Parsley the lion; A Gastronomic Companion; Bears and Forbears: A Life So Far, his autobiography; and the Monsieur Pamplemousse series of adult mysteries. Paddington Bear, however, is by far Bond’s most popular character; the books have been translated into more than 40 languages including Latin and Paddington is featured not only in the storybooks, but also in numerous picture books and learning and activity books for children. After several publishers rejected it, the book, A Bear Called Paddington, was accepted by William Collins and Sons (now Harper Collins) who commissioned an illustrator. This first Paddington Bear book was published Oct. 13, 1958, followed by the others in the series. More than 35 million copies of these books have been sold worldwide. Bond became a full-time author in 1965 after working for BBC (British Broadcasting Corporation) since 1941, first as an engineer’s assistant and then as a TV camera man. Paddington Bear is a popular figure in children’s literature, but he also offered important lessons. Bryn (see Dig Deeper below) says that Bond “encouraged us not to see refugees [Paddington was a refugee from Peru] as scary “other” – but as people who may just appreciate a warm hug and a marmalade sandwich.” Grayson [see Dig Deeper below] explores liberalism and “the tensions caused by the presence of the foreigner [Paddington] in societies perceived to be liberal.” Perhaps most important is that Paddington Bear, an adorable, bumbling bear with a fondness for marmalade sandwiches, has entertained generations of children with his adventures while, perhaps, also teaching subtle lessons. Was Paddington part of your childhood literature? Bryn, Eleanor. “Paddington Bear is a symbol of kindness to refuges we should never forget.” Quartz. Findon, Ross. “How eccentricity on the Isle of Wight helped shape Paddington Bear.” Isle of Wight County Press. Friedman, Gabe. “’Paddington Bear’ Author Found Inspiration in Jewish Refugee Children.” The Jerusalem Post. Mead, Rebecca. “Paddington Bear, Refugee.” The New Yorker. “Michael Bond.” Gale Literature Resource Center. Includes personal information, career, awards, a full list of Bond’s written works (he wrote much more than the Paddington Bear series) and additional information. For the Paddington Bear books, use ILL (Interlibrary Loan).